Here in the Northeast, we've had weeks and weeks of bitterly cold weather. A blizzard this week left us with piles of snow and frigid temperatures with wind chills below zero. On top of that, we've had coughs and sniffles that just won't quit. It's miserable. 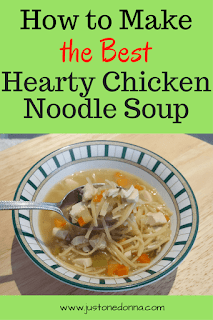 That means it is a perfect time for hearty soups like this homemade chicken noodle soup. 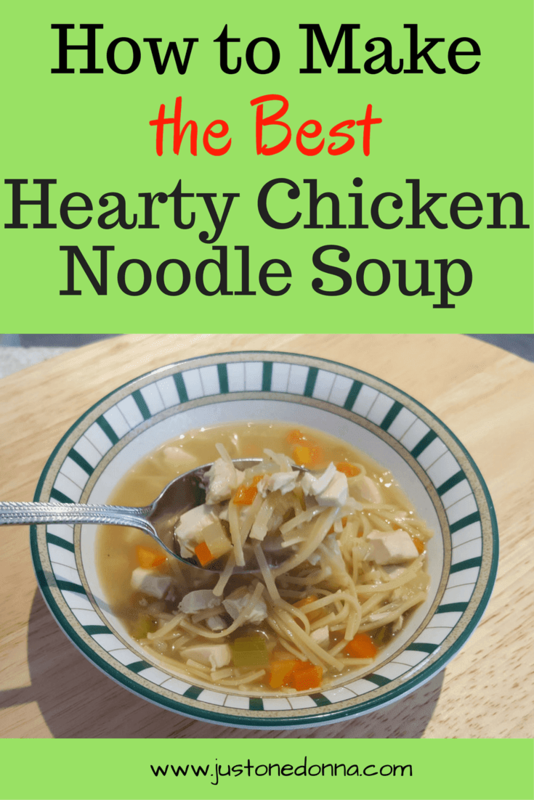 The best chicken noodle soup is made with just a few ingredients. The base flavor comes from carrots, onion, celery, and chicken stock. You'll want to be sure you are using the best, most flavorful ingredients you can find to make this hearty homemade chicken soup from scratch. The chicken stock is so important to a chicken soup that I only make chicken soup when I have homemade chicken stock, I want the stock I use to have a deep, rich flavor and I have been unable to find a commercial brand that satisfies me. If you make this soup with a commercial stock or broth, you might want to add a generous spoonful of Better Than Bouillon for deeper flavor. It's a secret ingredient I always keep on hand in my fridge. Dice your onion, carrots, and celery to a consistent size. It will help you to keep the texture of the vegetables consistent in your finished soup. I like to keep the size of the dice small because I prefer not to cook the vegetables too long. I think the end product chicken soup tastes best when the vegetables have not been overcooked. Similarly, because you are using cooked chicken breast, add the chicken at the very end and only cook the soup long enough to heat the chicken through. That way the chicken will stay tender and flavorful. My final tip is about the noodles. This recipe uses a thin egg noodle which I think suits the soup perfectly. You can use any noodle you prefer. If you are planning to serve the soup right away, go ahead and cook the noodles in the soup. If you are not serving the soup right away, it will be better to cook the noodles separately and add the cooked noodles at the very end to warm them before serving. Otherwise, the noodles will absorb all of your broth. 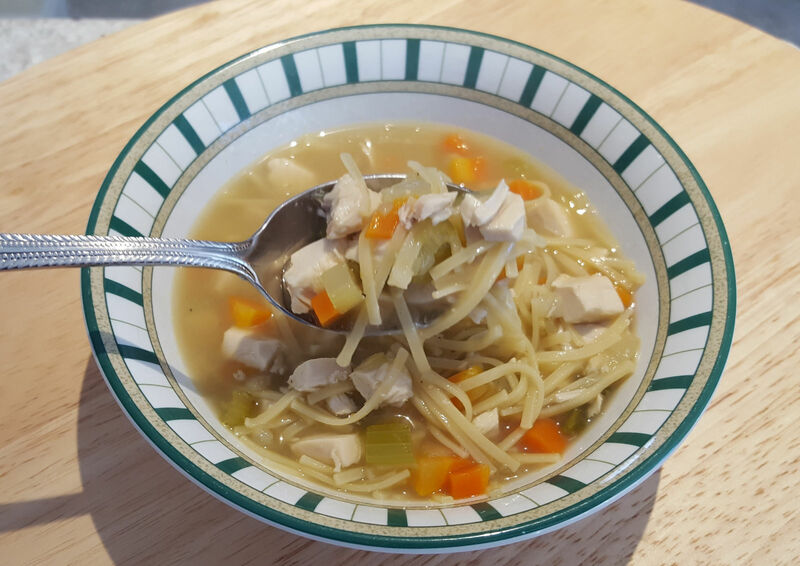 Watch my chicken noodle soup video below. Heat the oil in a Dutch oven over medium heat. 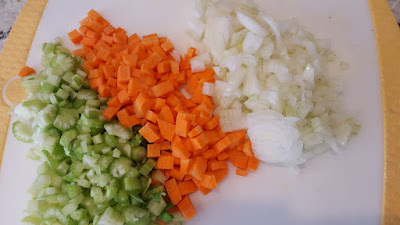 Add the onion, carrots, and celery, Season the vegetables with salt and pepper. Stir and cook until the vegetables are tender, about five minutes. Add the chicken stock. Bring to a boil and reduce to simmer. Simmer the stock and vegetables for about 20 minutes. Add the noodles to the pot and cook for about three minutes. Add the chicken to the pot and continue cooking until the noodles are tender and the chicken is heated through. Taste and adjust the salt and pepper as needed. Serve immediately. It's as easy as one..two..three. Thank you for sharing this recipe with your friends on Facebook, Pinterest, Twitter, and Yummly.